"Through the Capital Plan process, an integral tool to its development has been the creation of Project Execution Plans for each of the proposed recovery projects. Another invaluable tool for the ranking of these projects were a series of interactive workshops. 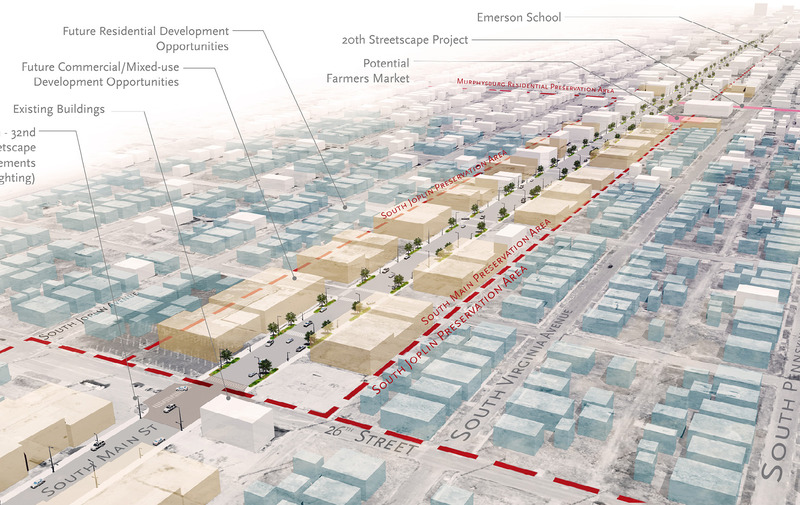 Ultimately, the plan focuses on four key areas of recovery: economic development, infrastructure and environment, housing and neighborhoods, and schools and community." Meetings were held with City Staff and external community stakeholders, as well as members of HUD to gain further insight. 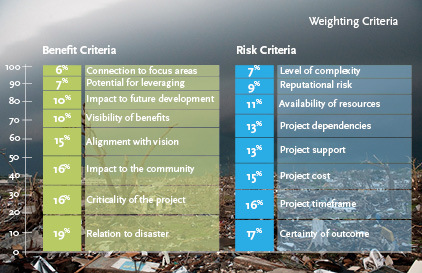 The planning team worked with the City to develop weighted criteria that would evaluate the associated risks and benefits of projects. 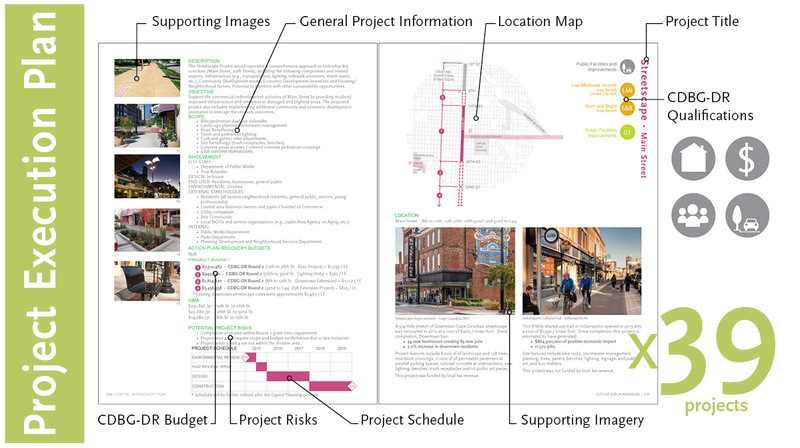 A "Project Execution Plan" was created for each identified project. These serve as the backbone of the CIP and will guide redevelopment. 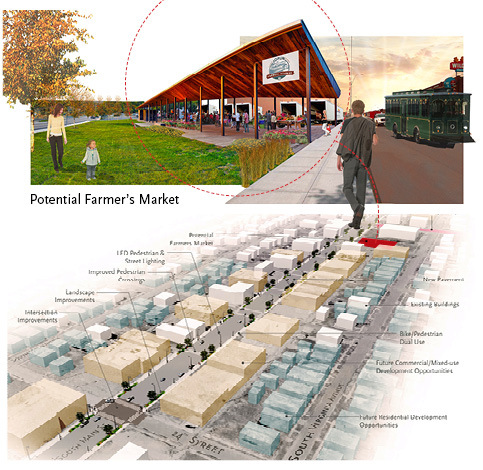 The streetscape projects represent a comprehensive approach to redevelop key corridors and support commercial redevelopment. 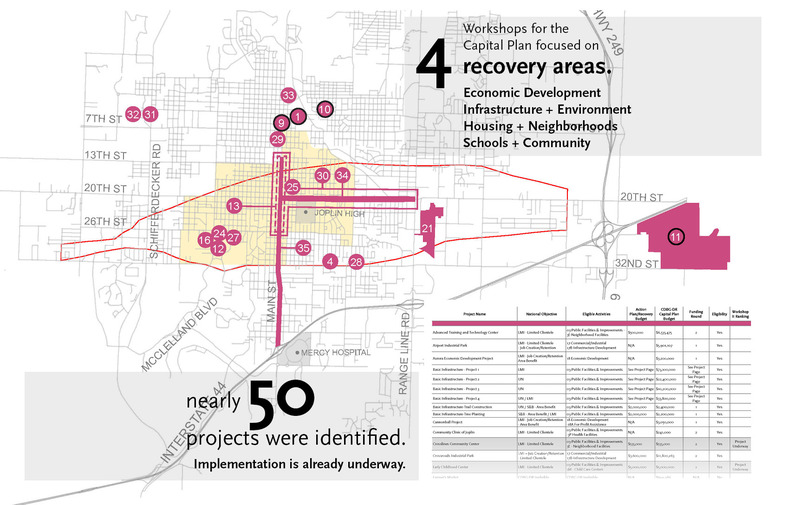 The Joplin CIP examined proposed recovery projects, and will guide the City as it rebuilds, enhance economic opportunities, and encourage population growth. 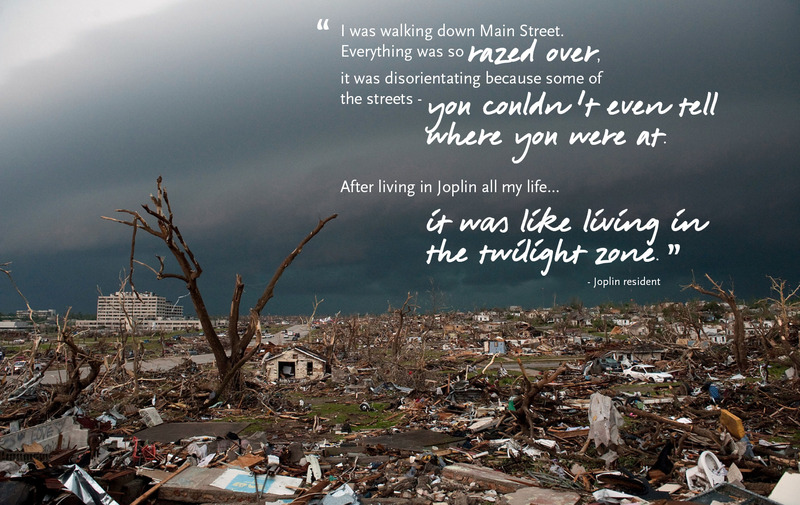 The City of Joplin, MO was devastated in May of 2011 by an EF5 tornado that cut a path of destruction 3/4 to a mile wide and 6 miles long through the heart of the community. Approximately 7.500 residential dwellings and 553 businesses were damaged or destroyed by the storm. 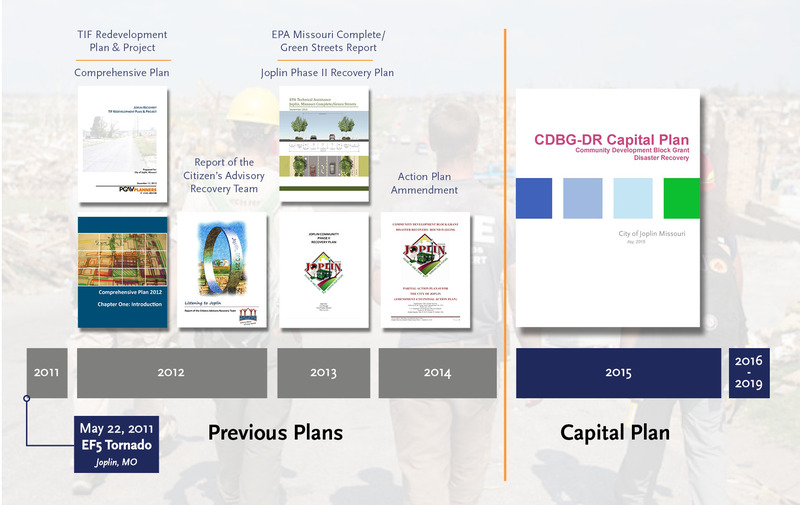 In January 2015, SWT Design, along with its partners began assisting the City of Joplin in the development of a Capital Plan to evaluate current potential disaster recovery projects that might be eligible for CDBG-DR funding.  Through the Capital Planning process, an integral tool in the effort has been the creation of a Project Execution Plan (PEP) for each proposed project. This tool allowed for the gathering of all relevant information about the projects into one location. The process for developing appropriate projects began with creating the Citizen’s Advisory Recovery Team (CART). 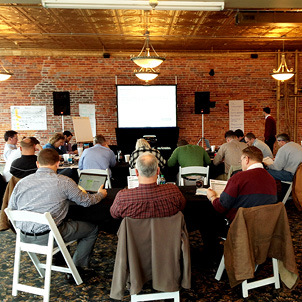 Projects were ranked through a series of interactive workshops. Over the next four years, this Capital Improvements Plan will guide the City of Joplin through long-term disaster recover, restoration of infrastructure and housing, and economic revitalization. 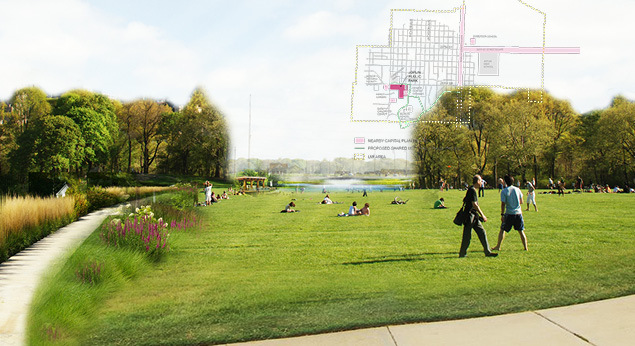 Projects in the Capital Plan vary in type and scope, and include Housing, Economic Development, Public Services, and Public Facilities Improvements. 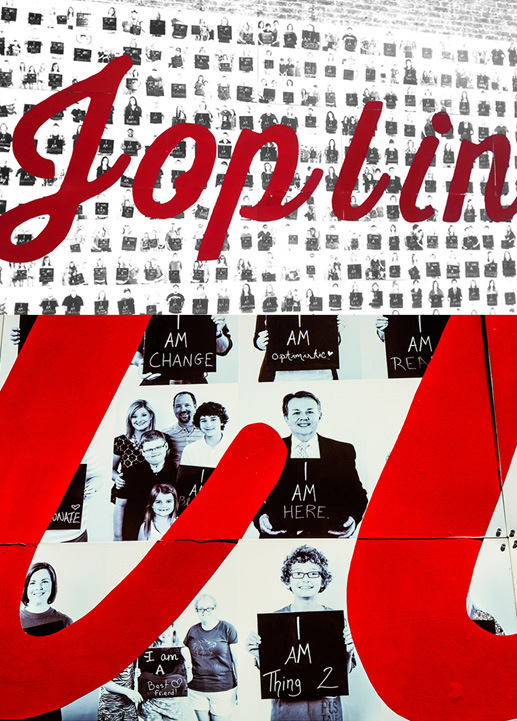 "Our team's ultimate goal was to provide the City of Joplin with a comprehensive, user-friendly implementation plan they can use over the next four years to shape recovery."